On Tuesday 9 April 2019 the Adelaide City Council re-opened the door to putting a commercial helipad on Park Lands. This saga began in late 2016 with a secret ‘commercial -in-confidence’ approach to the Council by helicopter operators. After a year of botched consideration (see below), the proposal was abandoned in January 2018. Despite this, a new batch of Councillors elected in November 2018 has re-opened the door to look again, at putting a commercial helipad somewhere on the Adelaide Park Lands. APPA would be unconcerned if there was any proposal to put a helipad on a non-Park Lands site, such as on top of a CBD building, or next to the Keswick interstate rail terminal. However, for obvious reasons, a commercial helicopter business would be incompatible with the peace and serenity of any park, especially the world-unique National Heritage-listed Adelaide Park Lands. On 9 April 2019, Council was asked to vote on a motion from Cr Phillip Martin that would have permitted continued investigation of potential helipad sites, while ruling out Park Lands sites. The vote was lost 6-5. Voting for the motion to exclude potential Park Lands sites were Councillors Phillip Martin, Robert Simms, Alex Hyde, Helen Donovan and Anne Moran. Thanks to each of these five Councillors for being alert and aware of the risks. We will continue to engage with the City Council to ensure that they are aware of the reasons why a site other the Park Lands should be preferred. 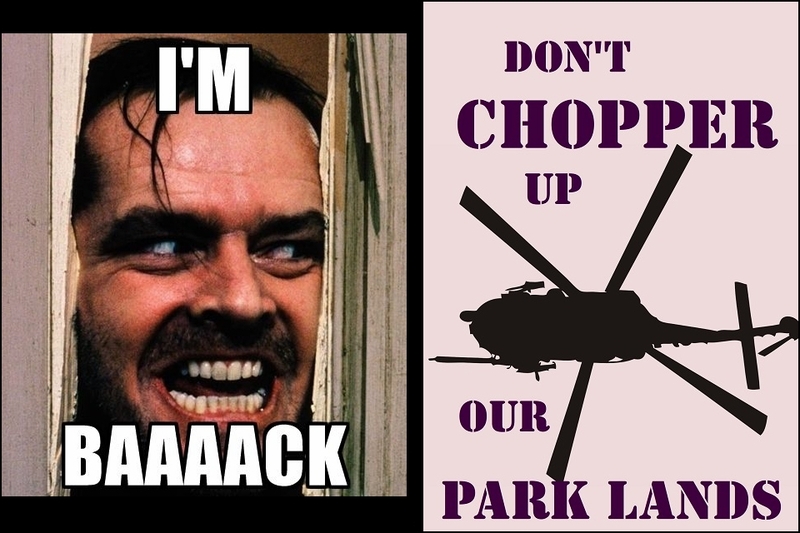 In September 2017 the Adelaide Council consulted on a proposal to amend the 'Community Land Management Plan' for Park 27 because they wanted to put a commercial joyflight helicopter business on Helen Mayo Park. This is the same riverside location that the State Government had also been targeting for a luxury hotel. APPA's submission pointed out that not only was this site a very poor choice for a helipad - the proposal was also illegal. You can read our submission here. The results of the Council's consultation were discredited in late October 2017 when it was revealed that supporters of the helipad had been offering a prize (of a $1,500 helicopter flight) to persuade people to vote "yes" to the Park Management Plan change. Even worse for the Council's plans, a commercial joyflight operator who used this site on a one-off basis in September 2017 was the cause of an "operational incident" with Adelaide Airport Air Traffic Control which led to the diversion of an inbound passenger jet. The Civil Aviation Safety Authority, investigating the incident, asked the Council to think again about the suitability of the site. After getting independent advice, the City Council at its meeting on Tuesday 30 January 2018 formally ditched this site, and voted to examine other possible locations for a helipad, just as APPA had been urging the Council to do. Congratulations to all those who joined APPA in pointing out to the Council in 2017 the unsuitability of this Park Lands location. If you'd like to help us in similar campaigns, then TAKE ACTION!